McKee's 37 Waterless Wash On The Go Concentrate does more than wash your vehicle – it leaves a clear coating of protection! The polymers bond to the vehicle to enhance cleaned surfaces. The coating is crystal clear and barely perceptible, except you’ll notice a richer finish. 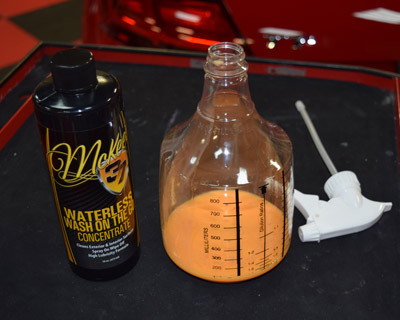 Use McKee's 37 Waterless Wash On The Go Concentrate on paint, glass, plastics, and metal. Use it on the wheels, tires, and exterior rubber trim, too. 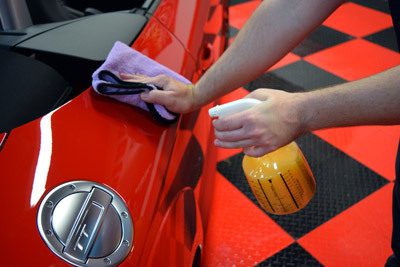 Mix up a bottle sprayer of this solution and touch up those spots on your vehicle this winter. It really works that easy, spray it on and using a micro fiber towel. Just make sure you don't use a dirty micro fiber towel and scratch your finish. I'm not sure how it would work to wash your entire vehicle, a lot of micro fiber towels for sure. This solution mixes easily and cleans extremely well. Have not tried on a very dirty car but on everyday dust and dirt it did a great job without damaging the cars surface. Even added a bit of shine after wiping off. I used this for the first time the other day on my 2015 Toyota Corolla in Barcelona Red wow what a shine and no streaks ! I will definitley be buying more of this product. Highly recommended ! Proshigh gloss , easy to use , no streaks! Best Waterless Wash out there. I can't believe the shine, doesn't leave any streaks. Easy to use and seems to be a very good value.